Yesterday marked one month until Christmas. Today, I am showing previously unheard of blog organisation and kicking off my seasonal posts. Hopefully by starting now, you'll have a chance to enjoy any recipes you like the look of before Christmas is over for another year. Unlike my last post, today's recipe has also been trialed, revised, re-trialed, and then posted. You can't take risks with Christmas! These pancakes could also do double duty for Thanksgiving, which I know is almost upon you in America. My original pancake idea was orange and berry, not pumpkin pie and berry. I made the orange and berry batch for dinner last week, when Mr Bite and I had one of our occasional pancake dinner nights (it would seem we have them about twice a year). Unfortunately, those pancakes did not turn out well! Some of this was due to starting with our small, not-ideal-for-pancakes pan. Some of it was due to my pathetic pancake flipping abilities. But, some of it was also due to the batter. As Mr B pointed out, orange juice is sticky, and orange juice in pancake batter sticks more than usual to the pan. 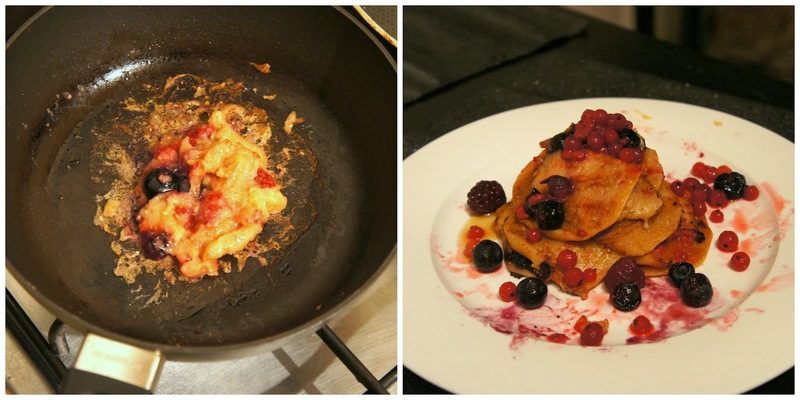 Orange and berry pancakes; the route to an edible stack was messy! Take 2 abandoned the orange and brought in pumpkin. I also made the batter thicker, which I find gives pancakes that are easier to flip. The end product was much improved. I haven't eaten many pumpkin pies in my lifetime, so I am probably not the best person to call a dish "pumpkin pie" flavoured. However, I also don't eat many pancakes, and so when I do, I want ones that are really delicious. These, dear readers, were really delicious. The pumpkin and spice mix blend together perfectly, the berries provided bursts of contrasting flavour, and the maple syrup made it all sing. My pancake making abilities are such that all outcomes are a bit on the messy side. However, I have no qualms about recommending these to you in taste, and no doubt that these could be perfectly circular if made by the right hands! Mix the mashed pumpkin and dry ingredients (flour, chia seeds, baking powder, mixed spice) together until well combined. Add the wet ingredients (milk, vinegar, vanilla) and stir well to combine. Allow to sit for at least 15 minutes. Add the berries to the pancake mixture and stir through. Heat a non-stick pan over high heat and spray with oil. Cook pancakes for approximately 3 minutes on each side, until golden. Submitted to Healthy Vegan Friday #71. I've said it before and I'll say it again: put the devilfruit in your cooking, and the devil will take over your kitchen. And, dear wise one, you were right. 'Twas a right devilish sticky mess! In such cases, pancakes for breakfast definitely sound indicated! Looks so yummy! Reminds me of pampoenkoekies from home (South Africa). But berries make these look much more scrumptious! These pancakes look beautiful and I love that they are pie-flavored! Definitely a nice way to spruce up a holiday breakfast! these pancakes look great and are so fluffy!